40mm 18K red gold 5N case, white dial, caliber 11 1/2" UN-815 self winding movement, black alligator strap. Water resistant to 50 meters. 40 mm 18K rose gold case, sapphire crystal, eggshell dial, Caliber UN-815 self-winding movement with COSC certificate, date, leather strap, pin buckle. Water resistant to 50m. 40 mm 18K rose gold case, sapphire crystal, black dial, Caliber UN-815 self-winding movement with COSC certificate, date, leather strap, pin buckle. Water resistant to 50m. 40 mm 18K rose gold case, sapphire crystal, genuine enamel cloisonné dial, Caliber UN-815 self-winding movement with COSC certificate, leather strap, folding buckle. Water resistant to 50m. 40mm 18K rose gold case, eggshell dial, self-winding movement, approximately 42 hours of power reserve, leather strap with standard buckle. Water resistant to 50 meters. 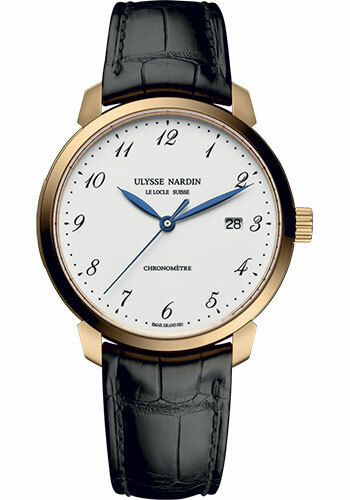 The Ulysse Nardin Swiss Watch Company was named after its founder, Ulysse Nardin, an accomplished watchmaker in 1846 and started in Le Locle Switzerland where its headquarters remain today. Nardin is renowned for releasing extremely accurate and ultra high quality timepieces and the current wristwatch collection includes styles such as Maxi Marine Diver, GMT Perpetual, Quadrato, El Toro, Big Date Dual Time, Sonata Cathedral, Skeleton Tourbillon Manufacture, Caprice, Michelangelo, Jade, Ludovico, Minute Repeater, Hour Striker, Stranger, Classico, Executive Lady, Chronometer, Moonstruck and The Freak. SwissLuxury.Com sells authentic Ulysse Nardin watches at great discount sale prices and the Nardine line is more of a special boutique marque that is limited production and highly collectible.